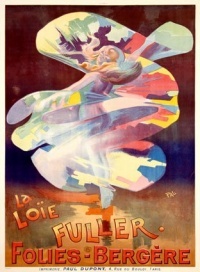 Loie Fuller poster for the Folies Bergère in the late 19th century. 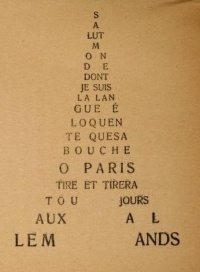 The so-called "Typographic pear", a calligramme which was published on the cover of Le Charivari of February 27, 1834, subverting the magazine's obligation to publish the condemnation by presenting the text in the form of a pear. Awful conflagration of the steam boat Lexington in Long Island Sound on Monday eveg., January 13th 1840, by which melancholy occurence; over 100 persons perished. Courier lithograph documenting a news event, published three days after the disaster. Graphic design is the process of communicating visually using text and images to present information. Graphic design practice embraces a range of cognitive skills, aesthetics and crafts, including typography, visual arts and page layout. Like other forms of design, graphic design often refers to both the process (designing) by which the communication is created and the products (designs) which are generated. While Graphic Design as a discipline has a relatively recent history, with the term 'graphic design" first coined by William Addison Dwiggins in 1922, graphic design-like activities span the history of humankind: from the caves of Lascaux, to Rome's Trajan's Column to the illuminated manuscripts of the Middle Ages, to the dazzling neons of Ginza. In both this lengthy history and in the relatively recent explosion of visual communication in the 20th and 21st centuries, there is sometimes a blurring distinction and over-lapping of advertising art, graphic design and fine art. After all, they share many of the same elements, theories, principles, practices and languages, and sometimes the same benefactor or client. In advertising art the ultimate objective is the sale of goods and services. In graphic design, "the essence is to give order to information, form to ideas, expression and feeling to artifacts that document human experience." During the Tang Dynasty (618–907) between the 4th and 7th century AD, wood blocks were cut to print on textiles and later to reproduce Buddhist texts. A Buddhist scripture printed in 868 is the earliest known printed book. Beginning in the 11th century, longer scrolls and books were produced using movable type printing making books widely available during the Song dynasty (960–1279). Sometime around 1450, Johann Gutenberg's printing press made books widely available in Europe. The book design of Aldus Manutius developed the book structure which would become the foundation of western publication design. This era of graphic design is called Humanist or Old Style. In late 19th century Europe, especially in the United Kingdom, the movement began to separate graphic design from fine art. In 1849, Henry Cole became one of the major forces in design education in Great Britain, informing the government of the importance of design in his Journal of Design and Manufactures. He organized the Great Exhibition as a celebration of modern industrial technology and Victorian design. From 1891 to 1896, William Morris' Kelmscott Press published books that are some of the most significant of the graphic design products of the Arts and Crafts movement, and made a very lucrative business of creating books of great stylistic refinement and selling them to the wealthy for a premium. Morris proved that a market existed for works of graphic design in their own right and helped pioneer the separation of design from production and from fine art. The work of the Kelmscott Press is characterized by its obsession with historical styles. This historicism was, however, important as it amounted to the first significant reaction to the stale state of nineteenth-century graphic design. Morris' work, along with the rest of the Private Press movement, directly influenced Art Nouveau and is indirectly responsible for developments in early twentieth century graphic design in general. 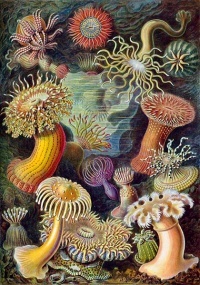 The name "Graphic Design" first appeared in print in the 1922 essay "New Kind of Printing Calls for New Design" by William Addison Dwiggins, an American book designer in the early 20th century. Raffe's Graphic Design, published in 1927, is considered to be the first book to use "Graphic Design" in its title. The signage in the London Underground is a classic design example of the modern era and used a typeface designed by Edward Johnston in 1916. In the 1920s, Soviet constructivism applied 'intellectual production' in different spheres of production. The movement saw individualistic art as useless in revolutionary Russia and thus moved towards creating objects for utilitarian purposes. They designed buildings, theater sets, posters, fabrics, clothing, furniture, logos, menus, etc. Jan Tschichold codified the principles of modern typography in his 1928 book, New Typography. He later repudiated the philosophy he espoused in this book as being fascistic, but it remained very influential. Tschichold, Bauhaus typographers such as Herbert Bayer and Laszlo Moholy-Nagy, and El Lissitzky have greatly influenced graphic design as we know it today. They pioneered production techniques and stylistic devices used throughout the twentieth century. The following years saw graphic design in the modern style gain widespread acceptance and application. A booming post-World War II American economy established a greater need for graphic design, mainly advertising and packaging. The emigration of the German Bauhaus school of design to Chicago in 1937 brought a "mass-produced" minimalism to America; sparking a wild fire of "modern" architecture and design. Notable names in mid-century modern design include Adrian Frutiger, designer of the typefaces Univers and Frutiger; Paul Rand, who, from the late 1930s until his death in 1996, took the principles of the Bauhaus and applied them to popular advertising and logo design, helping to create a uniquely American approach to European minimalism while becoming one of the principal pioneers of the subset of graphic design known as corporate identity; and Josef Müller-Brockmann, who designed posters in a severe yet accessible manner typical of the 1950s and 1970s era. The growth of the professional graphic design industry has grown in parallel with the rise of consumerism. This has raised some concerns and criticisms, notably from within the graphic design community with the First Things First manifesto. First launched by Ken Garland in 1964, it was re-published as the First Things First 2000 manifesto in 1999 in the magazine Emigre 51 stating "We propose a reversal of priorities in favor of more useful, lasting and democratic forms of communication - a mindshift away from product marketing and toward the exploration and production of a new kind of meaning. The scope of debate is shrinking; it must expand. Consumerism is running uncontested; it must be challenged by other perspectives expressed, in part, through the visual languages and resources of design." Both editions attracted signatures from respected design practitioners and thinkers, for example; Rudy VanderLans, Erik Spiekermann, Ellen Lupton and Rick Poynor. The 2000 manifesto was also notably published in Adbusters, known for its strong critiques of visual culture. Unless indicated otherwise, the text in this article is either based on Wikipedia article "Graphic design" or another language Wikipedia page thereof used under the terms of the GNU Free Documentation License; or on original research by Jahsonic and friends. See Art and Popular Culture's copyright notice. 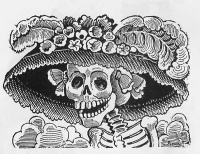 This page was last modified 09:08, 25 January 2014. This page has been accessed 13,003 times.